I recently pulled Tony Bolden’s book Afro-Blue: Improvisations in African American Poetry and Culture from my shelf to look over some key passages that caught my attention when I first read it when it was published back in 2004. The decision of many blues poets to use voice/instrument techniques constitutes the most radical challenge to the literary conventions in the history of black poetry. However, since critics have been unable to imagine an alternative to a print-centered poetics, they have tended to ignore the artistic possibilities implied therein. Such indifference reflects a class bias that has a distinct history. Earlier this week, I was blogging about spoken word poetry and then black poets who read vs. black poets who perform. Thus, Bolden’s words about the incorporation of voice/instrument techniques were coming back to mind. But I was referencing relatively recent or modern developments. It’s possible to go back further, let’s say, to Margaret Walker, Langston Hughes, Paul Laurence Dunbar, and many others. Hughes’s initial appearance in Poetry magazine in the November 1926 issue included "Hard Luck”, “Po' Boy Blues," "Red Roses,""Suicide" -- all blues poems. With the publication of those pieces, Hughes was gaining access to a significant national venue and audience of poetry readers and at the same time, his works were challenging formal literary conventions. 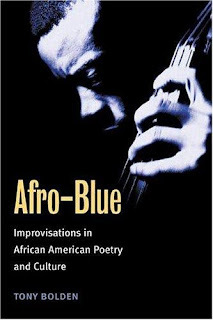 His poems were, in effect, presenting readers with the sensibilities of the blues.